We provide a fully serviced, modern and private function room for birthday parties, weddings, corporate events, training days, christenings and more. 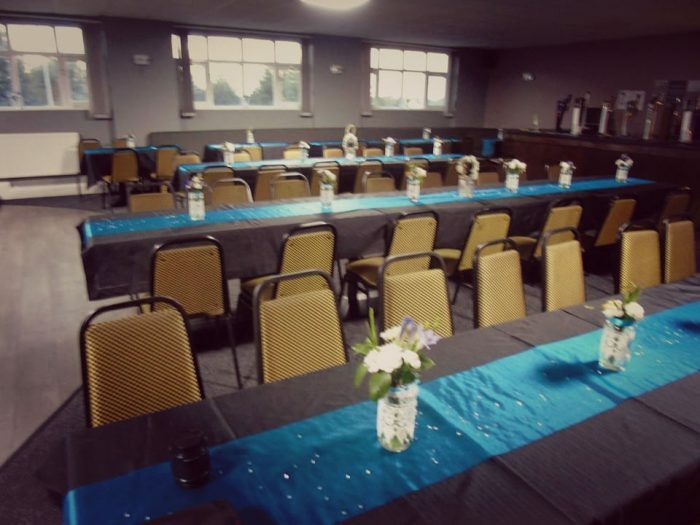 The function room holds up to 100 guests, is served by its own fully staffed, private bar offering a wide variety of alcoholic and soft, and hot and cold drinks. The room has its own dancefloor, stage space and PA system and projector screen to accommodate all uses. We have been described on many occasions as a “hidden gem” that “needs to be seen to be fully appreciated”. We offer an in-house DJ service, catering, cake making and room dressing, provided by dedicated partners who work closely with us, but if you would prefer to organise your own extra services then that’s fine too. In just over 4 years of operation we have seen a large number of repeat bookings and received endless compliments and kind words about the service received by our friendly team of bar staff, a fact we take great pride in. Based in Longton, Stoke-on-Trent, just opposite the Gladstone Pottery museum, we are easily accessible by the a50 and a number of public transport routes, with extensive parking on site and within a short walking distance. We are on the first floor of our building, unfortunately restricting access to some disabled users (please ask if unsure), however we have plans to incorporate a stair lift in the very near future to overcome this issue. What events do we host? We do accept 18-21 birthday parties, subject to terms and conditions being agreed.